One awesome mollusc deserves another, so let’s follow up last weeks octopus post with one on that group’s close relatives the cuttlefish. The deceptive patterns that cuttlefish put on come from their remarkable skin, and are controlled by a pretty impressive nervous system. The skin is covered in cells called chromatophores which contain granules of pigment. When a cuttlefish decides it’s time to disappear it looks around its surroundings and, with the aid of nerves that lead from the brain to the the skin, stretch and twist the chromoatophores on the skin’s surface in such as way as to change the colour of their cells, and ultimately their whole bodies. Just this week, researchers have reported evidence for a other trick that cuttlefish can pull off. When males of the Austrian Mourning Cuttlefish (Sepia plangon) see a female they put on a show, producing striped patterns that evidently impress the female. But these animals form male-dominated groups, and rival males often interrupt would-be woo-ers in mid-display. So, when they spy a receptive female, males want to put on their flamboyant show for her to judge, but also want to make sure they don’t attract the attention of rival males that might want to spoil the party. The male Mourning Cuttlefish’s answer to this problem? Using only half of his body to put on the female-impressing show, and throwing would-be spoilers off the scent by mimicking a female with the other half. This gender-splitting tactic seems to be pretty common. In aquarium experiments about 40% of males would attempt the deceptive signal when they were displaying in the presence of a rival. 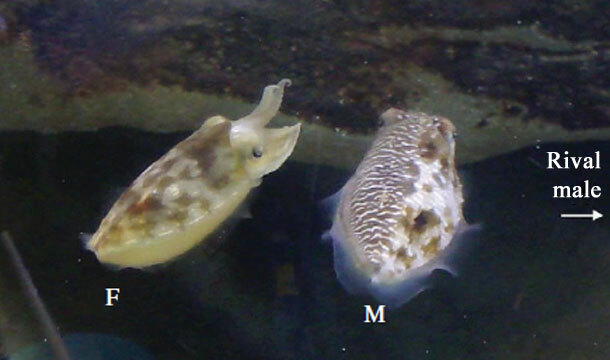 Just as the cuttlefish camouflage response requires information from the physical environment, the gender-splitting trick is influenced by what the male can learn of the social environment. If more than one female is available the male will display to both without bothering to hide his intentions for observers (probably because working out an angle from which he could excite two females while staying under the radar is just not possible). Likewise, if more than one rival male is about that don’t bother with the deception – since it wouldn’t be possible to maintain the illusion for two rivals viewing from different positions. They are pretty cool when you see them snorkelling, almost alien they way they float in the water and change colours. Thanks for the comment Derek, I’ve not seen them in the wild (octopuses are as close as I’ve got), must be very cool.